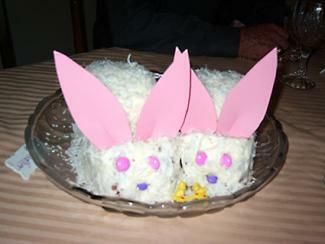 If you like cake decorating, Easter bunny cakes make a fun project. Check out the several design plans below and learn two ways to make bunny-shaped cakes and one technique for piping a bunny design onto a standard cake. Here are three different designs for Easter bunny cakes that require varying degrees of skill, yet neither one is terribly difficult to create. Read the directions several times before you begin, and you're sure to turn out an adorable Easter cake that can serve double duty as your holiday table centerpiece. Bake two 8-inch round cake layers in the flavor of your choice. Prepare a 12 x 18-inch cake board. One complete layer will be the bunny's face. Cut the second layer in half vertically, and then trim the bottom of the round to fit against the top of the bunny's face. Crumb coat the face with buttercream, and then separate the ears and position them on the head. Attach a star tip to a pastry bag and fill with buttercream. 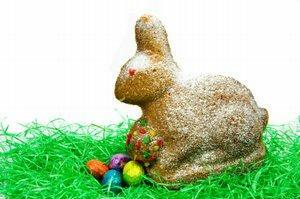 Cover all sides of the bunny plus its entire face with stars. Make an outline of stars around the outer edges of the bunny's ears, leaving the center area open. Choose a pink food color and tint more buttercream. Wash your star tip, attach it to a fresh bag and load it with the pink icing. Using a pastry bag, pipe pink stars to fill in the bunny's ears and create a nose. Lay down licorice lace to create the mouth, whiskers and an outline for the eyes, and then pipe black stars for the pupils..
Add a final border of stars around the entire bottom of the cake and you're finished. Bake two 8-inch round cake layers in whichever flavor you prefer. Cover a 12 x 18 inch cake board with green foil. Cut one layer in half vertically. Turn one half bottom side up and frost it, and lay the second half on top so both bottoms meet and the cut edges are aligned. Carefully turn the cake up to lay it cut side down on the prepared cake board; center it on the left half of the board with the front facing slightly inward. Frost generously. Viewing the cake from the side, cut out a V-shaped notch to create some definition between what will become the head and body of the bunny. Place two large marshmallows on each side of the cake to create the base for the four paws. Add one more marshmallow at the rear for the tail. Attach a multi-hole tip to a pastry bag, and fill it with buttercream icing. Working from the base up, begin piping the bunny's fur, completely covering the marshmallows and entire cake surface. There are two ways to create drop ears for your bunny. You can cut out ear shapes from card stock, gently fold them in half and insert them into place. Alternatively, you can cut ears from rolled fondant, lightly paint them pink in the middle with paste coloring and fold in them in half. Let them dry for about an hour and insert them as drop ears on either side of the head using a little fresh frosting to help the stick. Insert two pink jelly beans on the face for the eyes, and one pink jelly bean for the nose. Paint six toothpicks with thinned pink paste coloring and insert three on each cheek for the whiskers. Repeat the entire procedure with the second cake layer, placing that bunny on the board as the mirror opposite of the other. 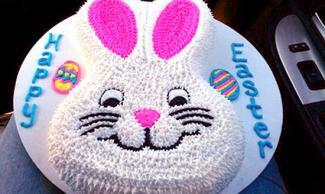 Bake a cake in a bunny shaped pan or carve one out of sheet or round cakes. Wait for the cakes to cool and then crumb coat them with your best buttercream frosting. Make a second, thicker layer of buttercream frosting once the first frosting layer has set. This is so it can support the weight of all of the marshmallows. Add in the bunny face and ear details before you begin covering the bunny in marshmallows. For example, add a large pink marshmallow to represent the nose, blue or green gumdrops to be the eyes, and outline the pink inside of the bunny's ears. Place mini pink cotton candy inside the bunny's ears and on top of his tail. 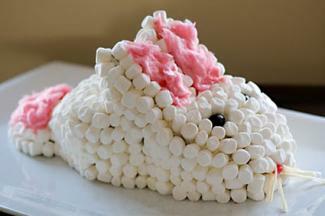 Add mini white marshmallows to the rest of the bunny cake. Use cut red or black licorice to make the u-shape for the bunny's mouth on top of the marshmallows. Add three pieces of cut black licorice to the sides of the bunny's nose for whiskers. If you or the kids make a mistake or want to adjust the spacing of the marshmallows, make sure it is done soon after completing the Easter bunny cake. This way, the frosting will not have crusted and it is easier to fix any mishaps. If creating an entire bunny shaped cake seems like too much work, you can always pipe an Easter bunny on top of a standard cake. Practice on wax paper first until you like the way your bunny looks, and then you're ready to add one to your cake. Using a large round cake decorating tip, create the bunny's body by piping a fat horizontal tube of buttercream that's about three inches long. Be sure to use a steady pressure on the bag, keeping the tip in the body and allowing the icing to build up to the thickness you desire as you slowly pull it forward. When you reach the end, stop applying pressure and gently remove the tip. Next, create the head in the same fashion. Push the tip slightly into the top of one end of the body, apply pressure to your icing bag and build up a rounded mound. Release pressure and gently pull the tip out of the icing. Switching to a medium round tip, use the same basic technique to add four legs and a tail. If your buttercream is fairly stiff, you can try piping upright ears; otherwise, drop ears look nice too. Use the same tip to add two puffy beads for your bunny's cheeks. 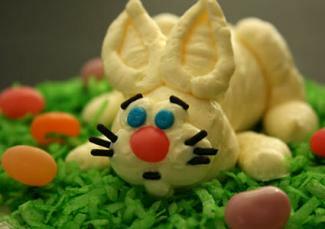 Use a small round tip to pipe eyes, whiskers and other details using the colored buttercream of your choice. Cake decorating Easter bunny cakes does take more work than purchasing a finished cake from a shop, but there's nothing like the satisfaction of doing it yourself. See Pictures of Easter Bunny Cake Ideas to view more fun designs.